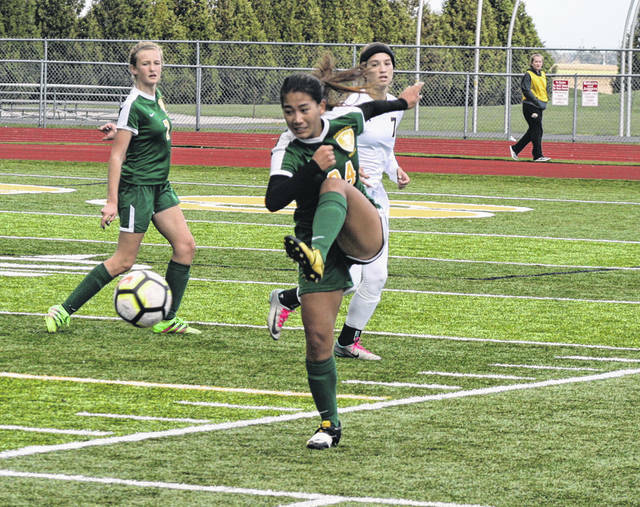 Asia Gensch of Evergreen kicks one during a Division III girls soccer sectional final Saturday. She scored the winning goal in overtime to lift the Vikings to a 3-2 win. Sydney Woodring of Evergreen controls a ball near midfield Saturday. She scored a goal for the Vikings. They were told they weren’t “old” enough. They hadn’t beaten anyone yet. And they will crumble under adversity. Well maybe because they start as many as seven freshmen, Evergreen may not be very old. However down 2-1 in a howling, biting wind at Pifer Field with just over a minute left in regulation, the Vikings found a savior in the form of Paige Radel’s goal, then found yet another hero in overtime as Asia Gensch drilled a shot just under the crossbar with 5:12 left as the Vikes beat Ottawa-Glandorf 3-2 to win a Division III sectional championship Saturday. The title is the first for Evergreen in just their third year of the program. The game was played in winds that gusted as high as 45 miles per hour and a frigid, stinging rain as the temps dropped from the low 50’s to start the game through the 40s. 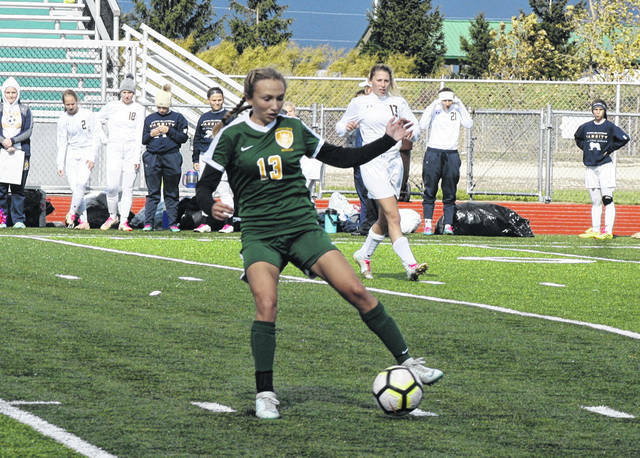 Playing against the wind in the first half, it was Evergreen that actually took a 1-0 lead when Radel deked out a pair of Titan defenders on the right side and fed Sydney Woodring coming down the middle, and the freshman hammered the back of the net from about 15 yards out. That lead was short lived, as three minutes later Ottawa-Glandorf’s Caitlin Bockrath lofted a shot that carried over goalie Myra Kuszmaul’s head and knotted the score, 1-1. However, Kuszmaul’s athleticism kept the net clean the rest of the way as the Titans took 10 shots with the wind in the first 40 minutes. The first half of the second 40, it looked as if the Titans were still playing with the wind as much of that time was played in the Vikings end, and O-G broke through in minute 60 when Kristin Siefker scored on a knuckball floating free kick, giving the Titans a 2-1 lead. “Surprisingly I thought we controlled the ball pretty well against the wind in the first half,” said Viking coach Joshua D. Radel. “I thought for sure coming out in the second half having the wind at our back we were going to be ready to fire on all cylinders and really possess in their half. That lead held into the last two minutes as the Vikings peppered shots over and over at the net until Radel took a throw in off a Titan defender left of the net and blasted a rocket into the goal with 1:22 left to bring Evergreen back even. The Vikings had a couple of chances in the last minute but shots by Emma Bettinger and Radel went just outside the goal, taking the teams to an extra 15 minutes. Again the Vikings controlled the Titans side of the field and finally in the 10th minute of the extra period, Gensch took the rebound off a Woodring shot that was blocked and rifled a left-foot blast that made the Vikings a winner. The Vikings, who outshot O-G 22-14, now advance to the district semifinal to play Archbold at Napoleon, Wednesday at approximately 7 p.m.
Evergreen is 10-4-1 on the season.